The infections of the respiratory tract are commonly found among adults and children. There are great natural remedies that can offer relief from the common symptoms related to throat and lung problems. Thyme and honey are powerful products of nature that are helpful for relieving the symptoms due problems with the respiratory tract. Let us mention why honey and thyme are beneficial for the lungs and for our overall health, before we share a recipe for a healthy and effective homemade cough syrup made from thyme and honey. Thyme in Latin Thymus vulgaris, has been used since ancient time due to its healing characteristics and as well as other aims. It was used by the Ancient Egyptians like an agent for embalming, the Greeks used it in the temples as an incense, and the Romans were adding it to the alcoholic drinks as aroma. The father of modern medicine, Hypocrates, also mentioned thyme as a natural remedy for respiratory problems and as an amazing culinary herb that people can grow in their gardens. The herbalists that are renowned, Maude Grieve and Maria Treven, have recommended the thyme as a cure for pneumonia, asthma and whooping cough, apart from other serious diseases that it can also help cure according to them. Thyme has great antispasmodic properties. This means that it is helpful for relieving and preventing spasms that are involuntary in the organs, which is the reason for causing aches, coughs, and cramps. It is soothing the persistent symptoms of coughs and is stopping the violent coughs, and in meanwhile it calms the nervous system and promotes the good sleep. The antibacterial, antiviral and antiseptic and antiviral properties of thyme is due to the compounds carvacrol, thymol, camphene, and caryophyllene. They effectively fight against bacteria and viruses. The essential oil of thyme also can be applied to wounds and sores for preventing infections. Moreover, thyme is an expectorant, which means that it promotes the secretion of phlegm and mucus from the respiratory tract and it clears the lungs and frees the airways naturally. Thyme is helpful for fighting against the inflammation and it is known as an antihistamine. It relieves the symptoms of coughs and asthma which appear due to allergies. It also boosts the immune system being an excellent source of vitamin C, A, iron, manganese and fiber. Did you know that 60 000 bees have to travel approximately 55, 000 miles and collect pollen from 2 million flowers to produce enough nectar for only one pound of honey? Honey is one of the greatest natural healing products, as well as the most delicious. As a product of the labor of bees it is known as a symbol of blessing and richness since long time ago. The health benefits of honey are numerous, but we will mention the ones that are relevant for our topic. Honey is forming a layer in the throat and the mouth which is protective and eases irritation. Children often suffer from infections of the respiratory tract, particularly in its upper area. Usually the infection’s symptoms get worse during night time, and that causes terrible problems of breathing and it does not allow children to get a good night sleep. Studies have revealed that honey is a great medication for cough because of the ability to calm the membranes that are mucous and to soothe the coughing. As it is stated in one study from the Pediatrics journal from 2012, honey (two teaspoons) could cure a cough that is stubborn. When honey, in that amount, was given to small children (at the age of 1- 5), that had cough that was 30 minutes before sleep, coughing was reduced. Because of the alcohol and the ethereal oil in the honey the mucus is cleared in the throat. Honey has anti-inflammatory and anti-allergic properties, so it is great for fighting against the infections and preventing the attacks of asthma induced by allergies. Honey is energizing and refreshing our body when we feel fatigued or ill and during strenuous physical activities because of the content of glucose, which is quickly absorbed in the bloodstream. Honey is abundant with important minerals like selenium, magnesium, manganese, and also in amino acids and antioxidants. It immensely boosts our immune system and protects us from the damaging effects of free radicals, which can cause numerous diseases. It is also anti-bacterial and antifungal, protecting us from bacterial and fungal infections. 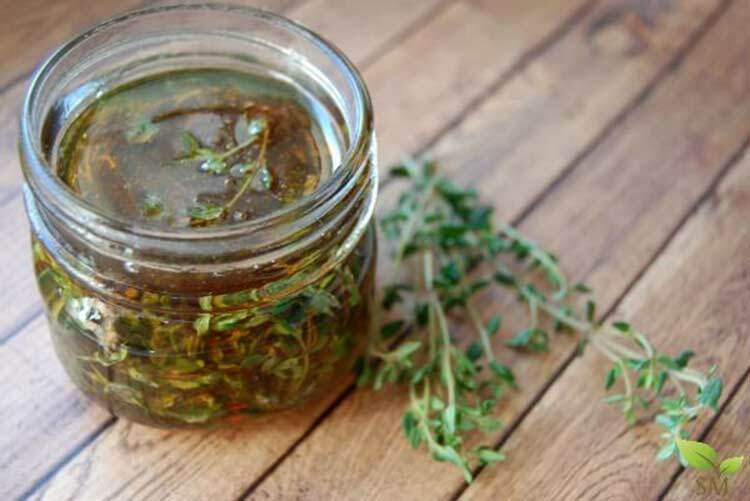 Below is a recipe that is very simple for a homemade cough syrup of honey and thyme for treating infections of the respiratory tract. Make a mixture of the dried thyme and the honey in the jar, stir well and leave it in a warm place for 2 weeks. In case it seems that the mixture is thick overly, you could put distilled water (50 milliliters) in the jar. You need to stir the elixir once every day. After 2 weeks, the homemade cough syrup should be strained with gauze or strainer for tea. Consume ½ tablespoon of the homemade cough syrup twice every day for reducing problems caused by respiratory infections.